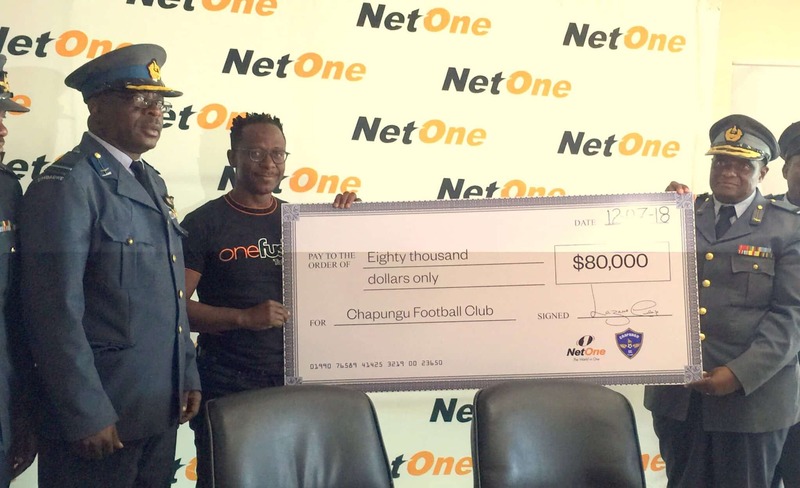 Converged mobile network operator, NetOne has unveiled an $80 000 sponsorship package for the Zimbabwe Air Force side Chapungu Football Club. NetOne Chief Executive Officer, Lazarus Muchenje officiated at the cheque handover ceremony where he said committed to supporting other sporting disciplines as a move to enhance talent development. “Sport in general is a unifier that brings us all together as Zimbabweans. We are not only focusing on football, but also have other sporting disciplines that we are currently looking at, with a view of assisting them to enhance talent development,” said Muchenje. “Sport the world over is big business and with the right support and mind-set, the nation will produce world class talent that will positively project our nation on the global stage” added Muchenje. He urged other corporates to support various sporting disciplines and bring Zimbabwe on the global map. He added that they are hopeful that the sponsorship will see Chapungu becoming highly competitive in the league as it will go a long way in stabilizing the team’s season operations. NetOne has invested heavily in the local game as it is currently bankrolling Harare football giants, Dynamos and Caps United as well as Highlanders from Bulawayo. The ceremony was attended by the Chapungu FC club hierarchy led by Director General Supporting Services – Air Commodore Masera, Base Commander from Josiah Tungamirai Airbase – Air Commodore Masakadza, Acting CEO of Chapungu FC – Wing Commander S. Ncube, Vice Chairperson of Chapungu FC – P. Chikwanda, Squadron Leader – T. Zowa, Airforce PR Officer – Squadron Leader Matarirano and the Chapungu FC Coach – Rodwell Dhlakama. Is Zimbabwe Ready For a Free and Fair Elections?